GBA Super Mario Advance 4: Super Mario Bros. 3 (USA WiiU VC) "e-reader levels" in 38:32.92 by Soig. Super Mario Advance 4: Super Mario Bros 3 is a platform video game developed and published by Nintendo for the Game Boy Advance. 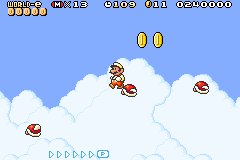 It is an enhanced remake of the Nintendo Entertainment System video game Super Mario Bros. 3, and is based on the remake found in Super Mario All-Stars for the Super NES. It contains several enhancements, including the addition of Mario and Luigi's voices by Charles Martinet, a multiplayer mode based on the original arcade game Mario Bros and the ability to scan e-Cards, utilizing two Game Boy Advances, the e-Reader, and a copy of Super Mario Advance 4. Once a card is scanned, it adds certain content to the game. Soig beats the 38 e-Reader levels in record time. This run uses a WiiU VC release of the game, because, unlike in the GBA versions, all the e-Reader levels are instantly available here. If you want to see all the normal levels beaten, see here.